Clinic Synopsis: Stopped horn is an extremely effective but often misunderstood technique required by today’s horn players. Passages for stopped horn occur in nearly every genre of music. This clinic will present some practical methods for helping young horn players learn the proper stopped horn technique. Also, included will be recommendations for various commercial mutes available and a discussion of mute techniques for working with your horn sections. Clinician Biographical Information James Boldin is an assistant professor at the University of Louisiana at Monroe. 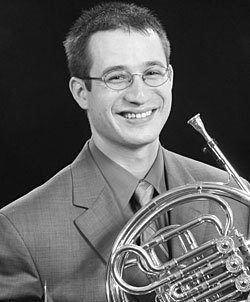 An active performer and clinician, he has performed and presented at the Southeast Horn Workshop and has presented clinics at the Louisiana Music Educators Association State Convention and the South Central Regional Music Conference. Boldin holds positions with the Monroe Symphony Orchestra and the Rapides Symphony Orchestra, and has performed with the Shreveport and South Arkansas symphony orchestras. His articles have been published in The Instrumentalist and The Horn Call: The Journal of the International Horn Society, and his musical arrangements have been published by Cimarron Music Press. He currently serves as IHS area representative for the state of Louisiana. Boldin earned D.M.A. and M.M. degrees from the University of Wisconsin-Madison, and a B.M. degree from Appalachian State University.